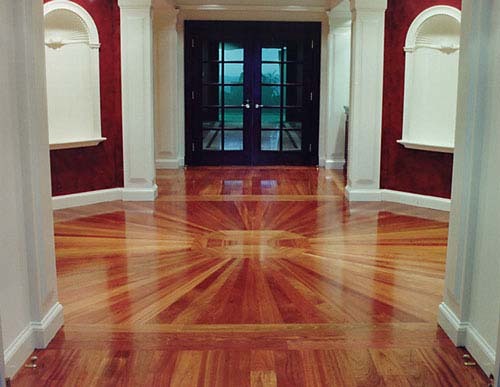 This article’s objective is to give a step by step process for preparing and cleaning a hardwood or gym floor for recoating with a floor finish in a commercial building. This cleaning procedure requires skilled labor, the proper equipment, products and tools to complete the process properly. Failure to do so will result in very unsatisfactory results of the floor finish coating. For this reason, it is recommended that professional contractors be hired to perform this process. This article will provide the novice and the expert with the knowledge to prepare and oversee the work whether it is performed with maintenance staff employees or a professional outside contracting service. If you’re not interested in floor finish preparation of hardwood floors or gym floors, please click on the following links to prior articles written about daily cleaning of wood floors and the do’s and don’ts of maintaining and cleaning hardwood floors(Cleaning Hardwood Floors Do’s and Don’ts and How to Clean Hardwood Floors – Simple Regular Cleaning). Required tools, equipment, supplies, etc. Identify where the water supply is located, where the equipment and supplies will be staged, etc. Reason: Removal of adhered debris and soils such as Gum, Stickers, Paint, Labels, etc. is a critical first step and will help insure that these soils do not interfere in the next step of the process. Reason: To remove loose soil and debris from the wood floor. Conventional dust mopping tools such as cotton mop dust heads are fine for this step Microfiber dust mop systems outperform cotton mop heads and are recommended for this step. Vacuuming the Wood Floor and Mats: Use a Dry Vacuum System – Upright, Canister, etc. Reason: Vacuuming is essential for removing any remaining loose debris that may compromise the floor finishing results. All mats should be cleaned and vacuumed prior to beginning the next steps. Reason: Provides the removal of any sticky residue or soil that maybe left on the wood or gym floor and provides initial abrasion to the existing floor finish coating. This step is critical in the adhesion of the floor finish recoat later. Reason: The purpose is to abrade the old floor finish coating to a smooth consistent and uniform appearance. This step will remove the gloss of the floor. 3M Surface Prep Pads are commonly utilized to achieve the dulling effect of the gloss of the old floor finish gloss in low and uneven spots on the wood or gym floor. Reason: This is a two step process that insures that any remaining dust, grit and soil is removed from the wood floor. The first step is to scrub the floor with a quality floor cleaner and the second step in this process is scrub the floor again but using only clear water in the solution tank of the automatic scrubber. Reason: This step is the last chance to remove any remaining loose debris from the floor. It is critical NOT to over wet the floor and the use of a microfiber mop will assist in preventing over wetting the floor. Over wetting can have a negative effect on the recoat floor finish. Reason: This step may seem small but it may be the most important because it is the last chance to inspect the complete floor for any missed spots or errors made during the preparation process. If there are areas that need to be corrected, now is the time to perform the tasks as outlined above in those areas requiring correction. 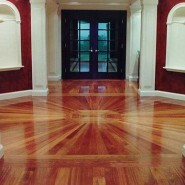 Reason: To provide a new and rejuvenated clean glossy appearance while protecting the wood floor. Be sure prior to starting the floor finish application task that all entrance and exit ways are secure. This will prevent accidental foot traffic on the wet floor finish. It is also advised that while ventilation can speed up the drying time of the freshly applied floor finish, if the ventilation is too strong, it can cause negative effects during the drying process and also blow unwanted loose soil and hair onto the wet floor finish. Follow the label for application coverage rates, the second coat process, dry times and application steps of the floor finish. It is also recommended that you work in a pattern that leaves you an exit route and while applying the floor finish insure that no splashing, pools of floor finish or heavy overlapping occurs on the floor. To insure proper, installation, sealing and repairs, it is recommended a profession is used. A professional contractor has the experience needed to complete and insure quality installation as well as maintenance and is money well spent. Using a professional will end up saving money in the long run.